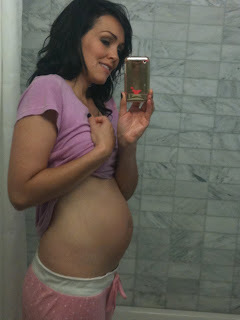 Kandeeland: My Cupcake in the OVEN! location: Hotel Allegro- Chicago (almost 5 months)....now we're 2 weeks later, but no new "belly" picture yet. I am so honored to have all the outpouring of love and support from everyone! I truly can't believe it! I am so blessed to have all of you to share love with! You truly are all my love bugs! I am so excited about this baby!!! I am so excited to share it all with you too! I must sleep because it's a big GLAMINAR day in Houston tomorrow. I've already met a few of the girls downstairs in the Hyatt lobby, and it's so fun to feel all the excitement! The Best FAKE Crepes you've ever had!